Six years ago today "a new professional sports league" - the American Ultimate Disc League - was publicly announced. Establishment of the AUDL was said to fill "a need for affordable sporting entertainment." AUDL Founder Josh Moore sought to "bring the [ultimate] game mainstream for the average person to experience ultimate played at its highest level. " 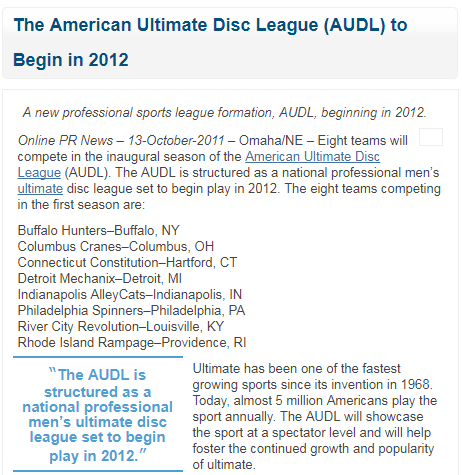 Per the press release: "The AUDL is structured as a national professional men's ultimate disc league set to begin play in 2012." AUDL began with eight (8) teams in 2012; Buffalo (NY) Hunters, Columbus (OH) Cranes, (Hartford) Connecticut Constitution, Detroit (MI) Mechanix, Indianapolis (IN) AlleyCats, Philadelphia (PA) Spinners, River City/Bluegrass (Louisville/Lexington, KY) Revolution, and (Providence) Rhode Island Rampage. In its most current season (2017), there were 24 AUDL teams across the U.S. (20) and in Canada (4).